Today's piece is not about Thackeray or the thrusting Becky Sharp but the vanity of writers. I will cover the book some time. Basically the 1848 first edition is worth between £500 and £1000 in a decent rebind with heading in rustic type on p.1, woodcut of the Marquis of Steyne on p. 336 (later omitted), & with the reading "Mr. Pitt" on page 453 (later "Sir Pitt"). Quite a bit more if a sharp copy in original publisher's cloth. 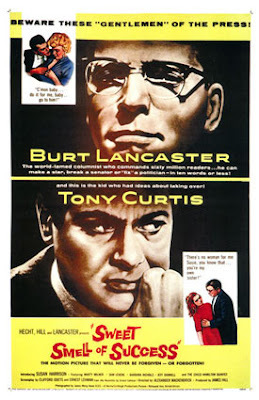 Above is a poster for the 1957 cult noir 'The Sweet Smell of Success' where Burt Lancaster plays a monomaniacal newspaper columnist (allegedly based on Walter Winchell.) Writers are naturally vain and a little self obsessed - try thinking of a modest writer. You need an extra large measure of self belief to write and even more to attempt to get published. However there are certain writers whose egotism goes way off the Richter scale. I remember once talking to Graham Greene (apologies for name dropping, but he talked to a lot of booksellers, he was at one point considering book dealing as a trade but his career took off). I was in a bookshop looking at a copy of of Jazz and Jasper by the writer William Gerhardie whom GG had known and admired. Greene said that Gerhardie's egomania was such that you could praise him for 2 hours but, if after that you offered some very minor criticism, you were immediately thrown out of his house. I have heard the same said of Booker Prize winner Salman Rushdie. His ambition as a young man was to be the most famous writer in the world, something he may have achieved for a short time but not quite in the way he had intended. V.S. Naipaul is said to be high up there but when we met him to buy some books he seemed relatively modest for a writer. Cool guy. Likewise Jonathan Miller ('this charming man' as far as I was concerned) often regarded as well arrogant. Greene appeared comparatively unassuming, unlike his brother Hugh ('did not tolerate fools gladly' said the obituarist.). Possibly when you get as famous as Greene, when every post brings letters full of fat cheques, you can let go of the self admiration. The vanity of authors is not restricted to the great or the famous - even hacks are possessed by it. I encountered a bloke, the author of a minor company history who was holed up in George Whitman's' writer's room at Shakespeare and Co., in Paris (any writer would do until a name came along ) the chap, Irish as I recall, thought of himself as on a par with Samuel Beckett. Talking of George W, writers of Beatnik books (often seen there) are usually major league bigheads. Hard to explain. Even a demonstrably bad writer like the completely uncollected Melvyn Bragg is known to have immense self regard, almost off the Egometer scale, but so many writers and media folk need his approbation that you will seldom hear a bad word about him. Writers who have never even published a book , poets usually, can be almost insane with self admiration and full of loathing for the 'crap' writers who seem to have made it. Martin Amis (in my opinion a great writer, but probably insufferable ) wrote a compelling study of envy, self regard and bitter literary rivalry in 'The Information'. First editions of this work, by the way, can still be bought fine in jacket and signed for £10. Simon Raven recalls hanging out with Gore Vidal and Isherwood in California; surprisingly Gore does not come across as above average arrogant, unlike Herr Issyvoo who could only exist on a diet of constant praise. Raven mentions E.M. Forster, of whom Vidal reported that he was annoyed about the outbreak of World War 2 - because it stopped people thinking about him and his work. Of course the writer who hits 11 on the Egometer is the worst of them all, the unfortunate William McGonagall, the so -bad -he's- good poet who regarded himself as an equal of Shakespeare. He achieved great fame however and must be considered (apart from Robbie Burns) Scotland's most famous poet. As Louis Menard said of his fellow writers gathered at the Procope in 'Reveries d'un Paien Mystique' (Paris 1876) '.. le Diable prend souvent les auteurs...par la vanité.' Our picture shows Joseph Connolly, a not unamusing writer and ex book dealer, who has just written his annual article about modern first editions for the Daily Torygraph. Humility is not one of his problems.